Visual Earth is the first study to analyze the growth of image sharing around the world in relation to economic, geographic, and demographic differences. We use a unique dataset of 270 million geotagged images shared on Twitter around the world between 09/2011—06/2014. In addition to analyzing all these posts worldwide, we look in detail at image sharing in 100 urban areas situated on six continents. What do millions of social media images shared in New York, Bangkok, Sao Paolo, or London tell us about each city? Which parts of a city receive most attention and which remain invisible? How can we quantify and measure these patterns? Inequaligram project analyzes 7,442,454 public Instagram images shared in Manhattan over five months. We use measures of inequality from economics to understand differences in sharing between parts of a city. The ratio between a Census tract with most images and the tract with least images is staggering: 250,00 : 1. 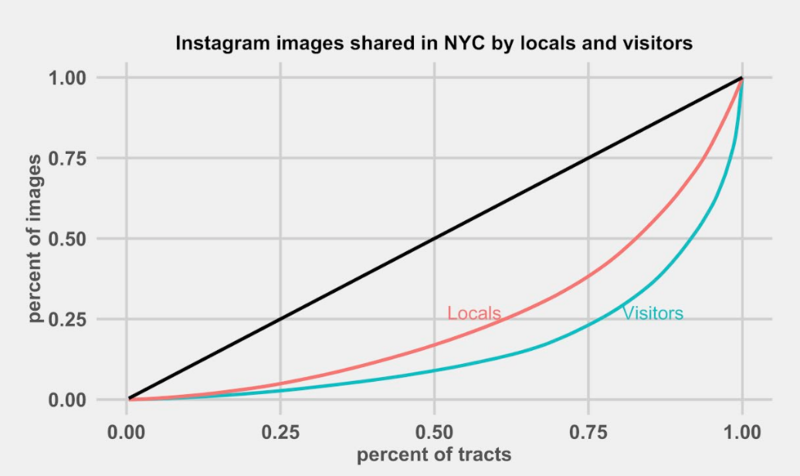 The inequality of Instagram images by locals turns out to be bigger than inequalities in levels of income, rent, and unemployment. The inequality of visitors’ images is larger than income inequality in the most unequal countries. 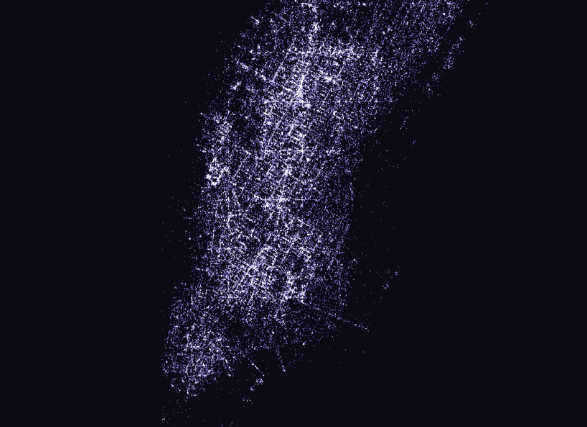 Geo Awesomness: What geotagged Instagram photos tell us about inequality in NYC? Quantifying effect of L train shutdown through Instagram data. 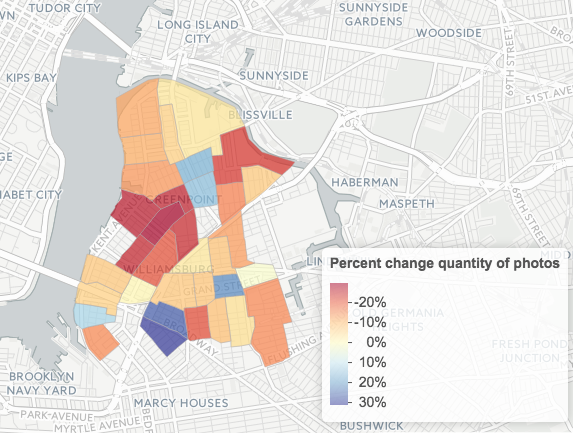 This project quantifies the effect of the L train shutdown on Williamsburg: do fewer people go to the neighborhood when the L train is shutdown? If so, how big is this effect? 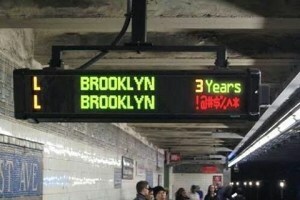 Luckily for us, there was no L train service between Myrtle-Wyckoff Ave station in Brooklyn and 8th Ave in Manhattan during the weekend of March 1 and 2, 2014. This allows us to compare the number of people that visited Williamsburg this weekend relative to other weekends and quantify the effect the L train shutdown has on activity in the neighborhood. In order to capture this effect, we will rely on Instagram data. We gathered all geo-coded Instagram images taken in Williamsburg and Greenpoint between February 26 and August 3, 2014 (490,000 images in total) and calculated the difference in the number of visitors in a normal weekend and one without L train service. 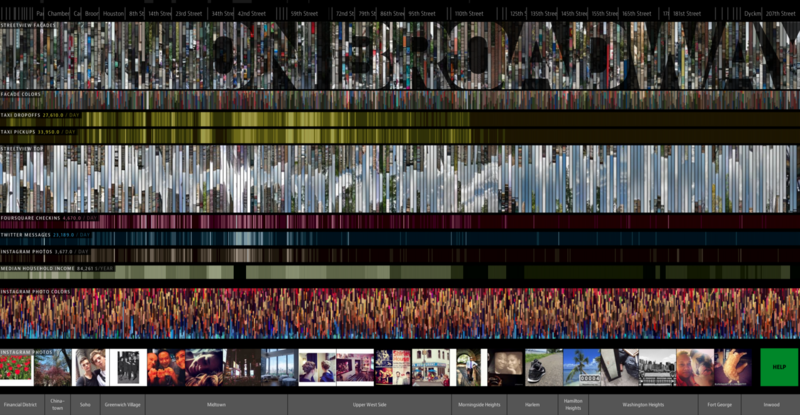 Interactive installation of life in 21st century city through compilation of social media data. The interactive installation ON BROADWAY represents life in the 21st century city through a compilation of images and data collected along the 13 miles of Broadway that span Manhattan. 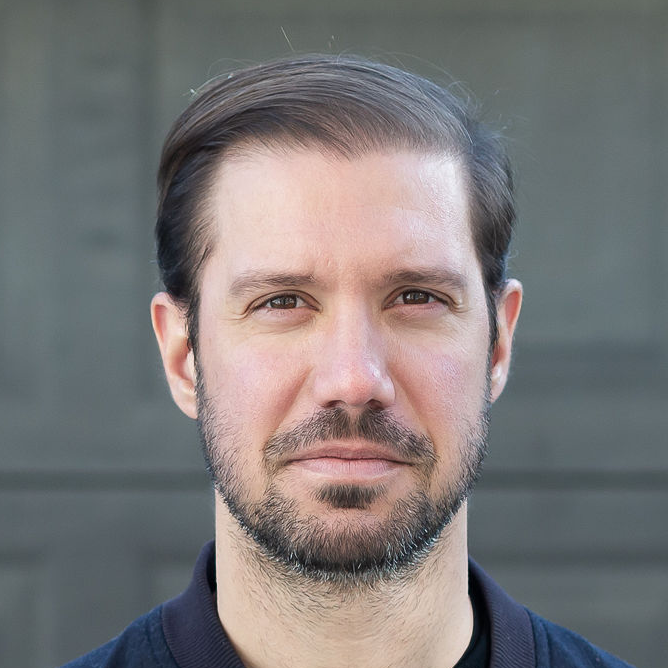 How to represent a “data city”? We did not want to show the data in a conventional way using only graphs and numbers. We also did not want to use another convention of showing spatial data – a map. 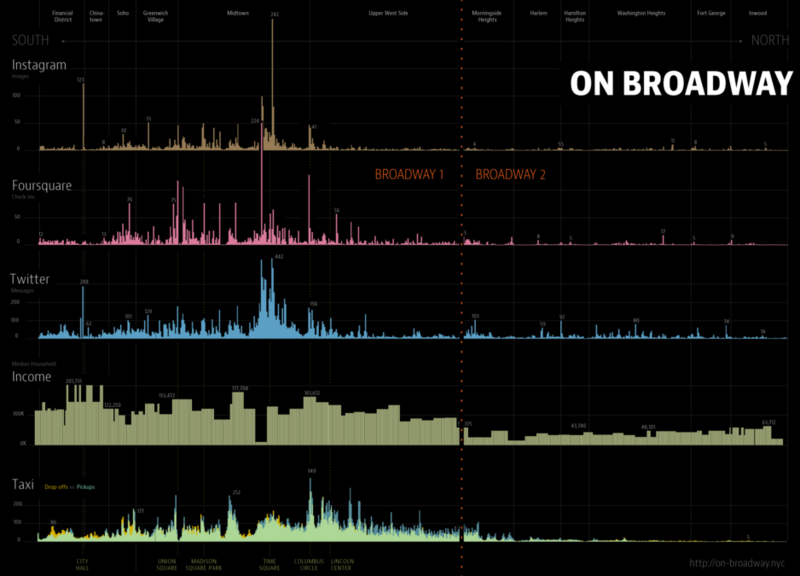 The result of our explorations is “On Broadway”: a visually rich image-centric interface, where numbers play only a secondary role, and no maps are used. The project proposes a new visual metaphor for thinking about the city: a vertical stack of image and data layers. There are 13 such layers in the project, all aligned to locations along Broadway. Using our unique interface (available as the online app and in large multi-touch screen installed at New York Public Library as part of “The Public Eye” exhibition), you can see all data at once, or zoom and follow Broadway block by block.